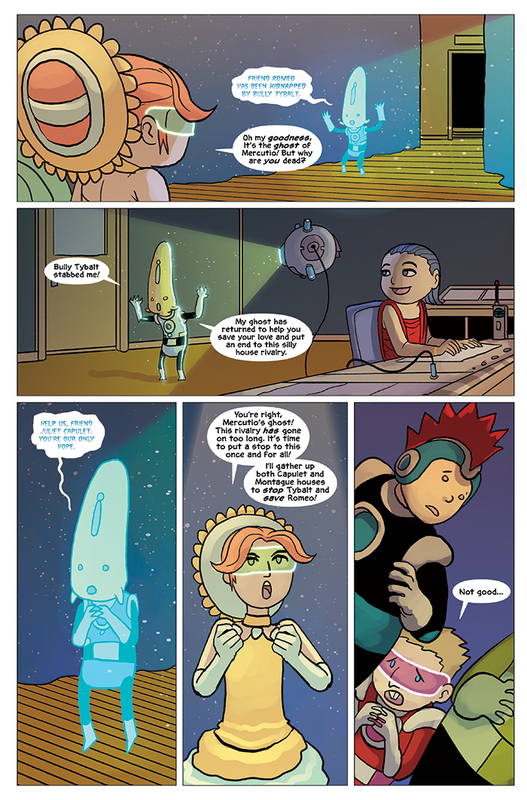 Happy Friday, and we finally see Gerty’s plan come together in today’s Albert the Alien! Knowing they have to retake the play from Wally, Gerty gets Miranda to project Albert’s image onto the stage where he does a little Star Wars parody. Anytime you can combine Star Wars and Shakespeare is okay in my book. Now that Juliet (Gerty) has her motivation from the ghost of Mercurtio (Albert), it’s time for her to put Wally in his place! We’re nearing the end of this chapter of Albert the Alien – with even more fun adventure, twists, and mysteries to be revealed! See you next week Wednesday and Friday for more fun adventures! This is the final week for the Kickstarter campaign to fund Albert the Alien Volume 1: New in School as a graphic novel! We’re so very close to the goal, and there are opportunities to appear in the printed book OR the webcomic series! If you haven’t checked out the Kickstarter yet, this is your final chance to support the book. The popular reward levels are disappearing quickly, so be sure to help spread the word and pledge today!